For my research I study merging galaxy clusters. Galaxy clusters are the largest gravitationally bound objects in the Universe and form through accretion of gas and by mergers with other clusters and galaxy groups. They are unique laboratories to study some of the most fundamental questions in astrophysics, related to the physics of particle acceleration and cosmic rays, the growth of large-scale structure, and the nature of dark matter. Massive clusters, particularly merging clusters, are also powerful cosmic telescopes, capable of magnifying distant galaxies, thus providing a probe of the early Universe. Radio observations of galaxy clusters have revealed the existence of large megaparsec-size diffuse synchrotron emitting sources: so-called radio halos and relics, depending on their location in the cluster center or outskirts. The synchrotron radiation implies the presence of cosmic rays and magnetic fields in the intracluster medium (ICM). With their enormous extent, these sources trace the largest particle accelerators in the Universe. It is thought that halos and relics follow shocks waves and turbulence which are created when two or more galaxy clusters collide and merge. At these shocks, particles are accelerated to relativistic energies and in the presence of a magnetic field these relativistic particles (cosmic rays) emit synchrotron radiation observable with radio telescopes. The physics of the acceleration process and origin of cluster-wide magnetic fields are still poorly understood. The acceleration mechanism can be studied via radio observations, in particular by mapping out the shape of the radio spectrum via observations at multiple frequencies. The properties of the magnetic field can be determined by obtaining polarization measurements. X-ray observations also play an important role, as they allows us to determine the shock Mach numbers and temperature and density of the ICM. 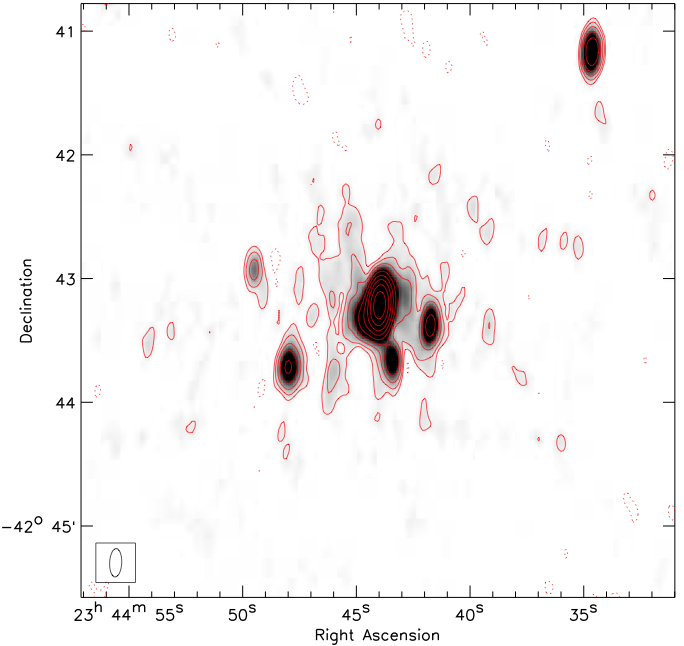 The diffuse radio emission from merging clusters is typically very faint, making their study difficult. The brightness of this emission increases towards lower frequencies and low-frequency observations are therefore preferred. However, high-quality low-frequency images are difficult to make due to the presence of the ionosphere with blurs the radio images. I developed a calibration scheme that corrects for the blurring effects of the ionosphere, allowing the first deep and detailed studies of relics and halos at frequencies below 300 MHz using LOFAR. LOFAR is a new revolutionary radio telescope operating at the lowest frequencies accessible from the ground. I am also involved in the LOFAR Surveys Key Science Project that aims to obtain deep images of the entire northern sky. Most of the cluster's mass is in the form of dark matter and by observing how galaxy clusters collide it is possible to determine the self-interaction properties of dark matter (SIDM). Clusters with double radio relics (with the relics located on opposite sides of the cluster center) likely pinpoint relatively simple binary merger events. In addition, these double relic clusters undergo mergers in the plane of the sky and are seen well after core passage. This all makes them good probes to constrain SIDM because we can model the merger events. Many of the double relic clusters that I studied now form the basis of a sample of clusters to test SIDM. This is part of a larger effort to observe and simulate merging galaxy clusters with the goal of determining the self-interaction properties of dark matter. For more information see the Merging Cluster Collaboration. Massive galaxy clusters enable the detection of faint distant objects that are magnified and amplified via the gravitational lensing by the clusters. Most studies of lensed objects behind clusters have been carried out and optical and submillimetre wavelengths. Recently, I started working on deep radio and X-ray observations of the HST Frontier Fields. 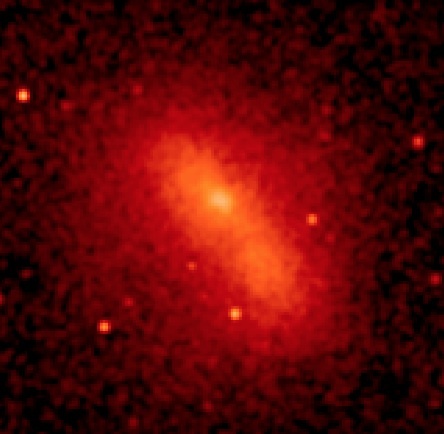 One of the goals of these observations is to search for lensed radio and X-ray sources. These observations will (i) provide a relatively unbiased tracer of star formation, (ii) give a unique extinction-free probe of galaxy growth and evolution, and (iii) probe heavily obscured active galactic nuclei (AGNs) - objects that are missed by even the deepest X-ray surveys. 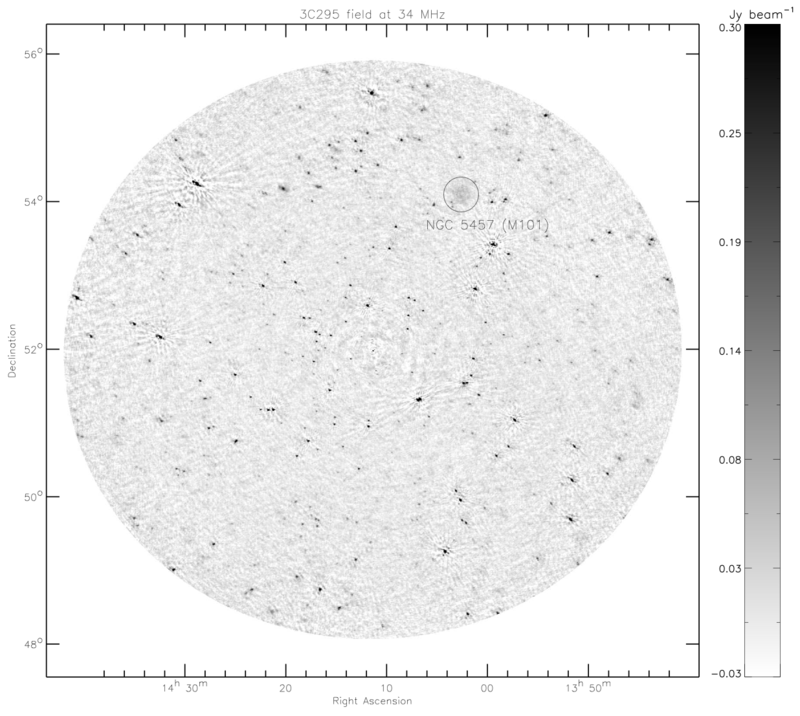 Using LOFAR, we obtained the deepest images of the sky below 100 MHz. These LOFAR images at 34, 46, and 62 MHz were used to derive radio source counts and hunt to for ultra-steep spectrum sources. The results are published in van Weeren et al. (2014). Radio image at 34 MHz of the 3C295 field made with the Low-band Antenna stations of LOFAR. With the GMRT we discovered the presence of a radio mini-halo in the Phoenix cluster (van Weeren et al. 2014). The central galaxy in the cluster is undergoing an extreme starburst, likely fueled by gas cooling in the cluster core. 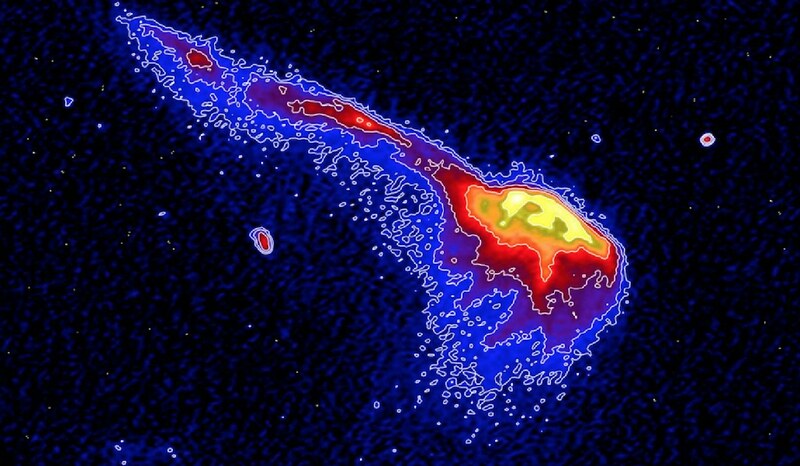 Radio mini-halos trace cosmic rays that might have been re-accelerated via turbulence. 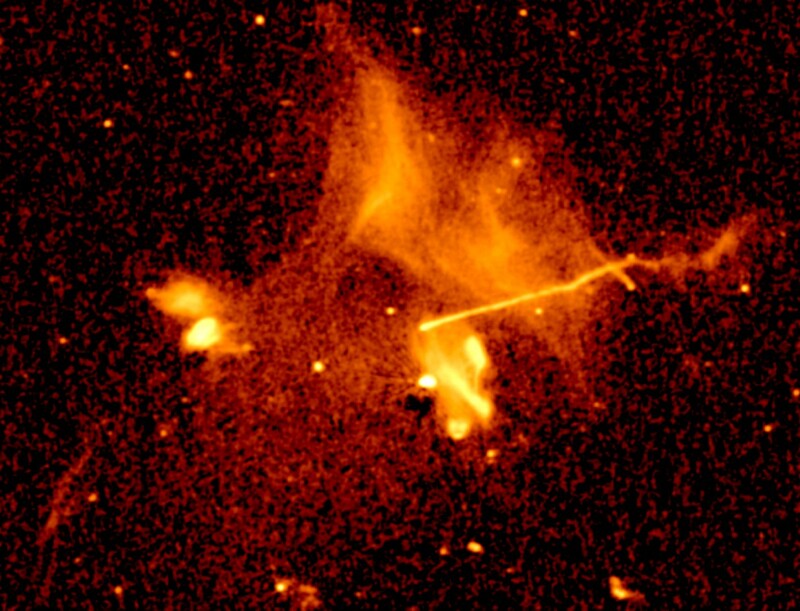 GMRT 610 MHz image of the Phoenix cluster. 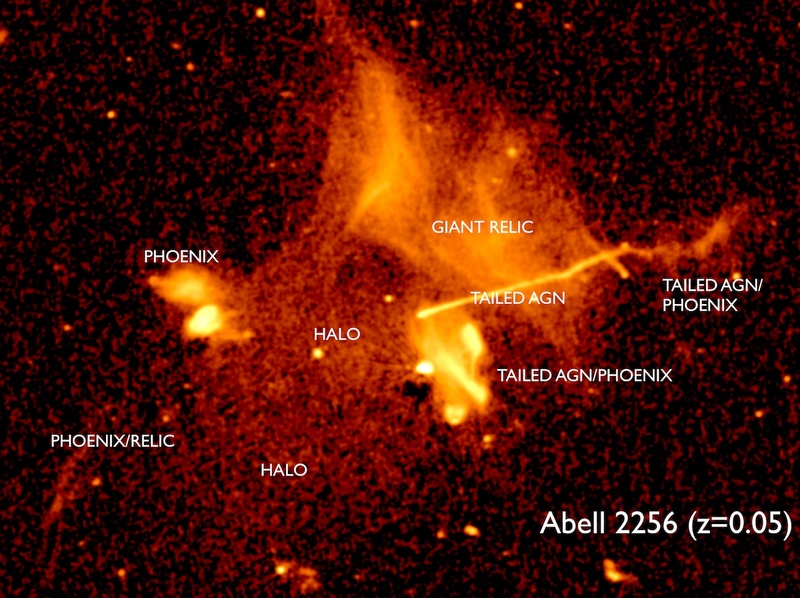 The bright central source is an active galactic nucleus associated with the cluster's central galaxy. The fainter radio emission around it comes from the mini-halo. 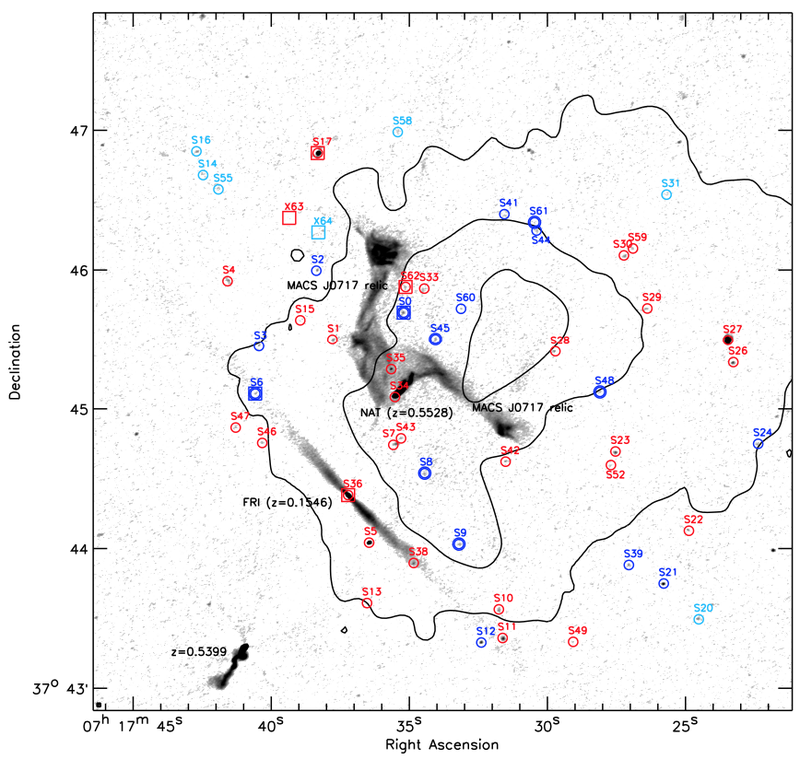 Deep Chandra, JVLA, and GMRT observations of the Frontier Fields cluster MACSJ0416 are published in ApJ. These observations indicate MACSJ0416 is a pre-merger system. A faint radio halo was also discovered in the cluster. Chandra 0.5-4.0 keV X-ray image. This shows a region of about 1 Mpc in size, see Ogrean et al. (2015). The image below shows the galaxy cluster MACSJ0717 located at a redshift of 0.545. This cluster was observed as part of a Chandra and JVLA program on the HST Frontier Fields Clusters. Our NRAO press release image can be found here. 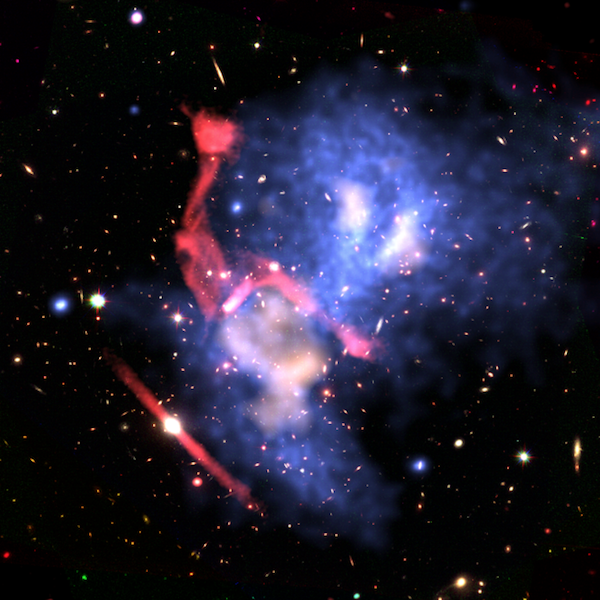 This combined radio (red), X-ray (blue), and Sunyaev-Zel'dovich (SZ) effect (orange, Mroczkowski et al. 2012) image reveals that the cluster is undergoing a complex merger event. The background image, showing galaxies and foreground stars, comes from the Hubble Space Telescope.